The Hong Kong-listed arm of the mainland's sixth-largest steelmaker secured a $320-million loan yesterday to finance its acquisitions and expansion plans. Shougang Concord International, a subsidiary of Beijing-based Shougang Group, also plans to increase its output of steel plates by more than 20 percent, to 2.3 million tons, behind a growing demand for the shipbuilding material. The four-year loan was granted by five banks - Bank of China (Hong Kong), Fubon (Hong Kong), China Construction Bank's Hong Kong branch, CITIC Ka Wah Bank and Agricultural Bank of China's Hong Kong branch. The loan adds to the 3.3 billion yuan that Shougang Concord already has in hand. Securing the loan is seen as a move to help the steelmaker bankroll its two latest acquisitions - totaling more than $400 million - as well as future acquisitions. The arm spent $26 million on a 6.4 percent stake in the Australian-listed Australasian Resources a year ago. In January, Shougang Concord reached an agreement to buy 156.8 million shares, representing a 19.73 percent stake, in Australian iron-ore miner Mount Gilbson, from Russia's Metalloinvest for $381 million. The deal is still being reviewed by Australian regulators. Cao Zhong, managing director of Shougang Concord, declined to comment about the pending iron-ore deal because it is under review. 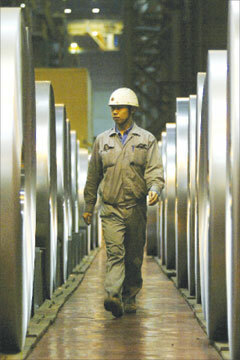 Prices of iron ore have jumped 65 percent so far this year, said Michael Chen, the company's deputy managing director. The rising cost of raw materials was reflected in the higher cost of steel plates sold by the firm. Prices of steel plates have doubled so far this year to $1,200 per ton. 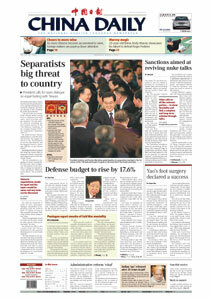 The price will further increase in the second quarter, Chen said. "The demand of steel plates is huge on the mainland," he said, adding that China is on track to replace South Korea as the world's largest shipbuilder. The mainland, which had been the third-largest global shipbuilder, has received 43 percent of the new shipbuilding orders this year, Cao said. Banking on the rising demand for steel plates, the company will boost its production to 2.3 million tons this year, up from 1.91 million last year. The increase includes 200,000 tons of new steel products for building oil pipes, Cao said.